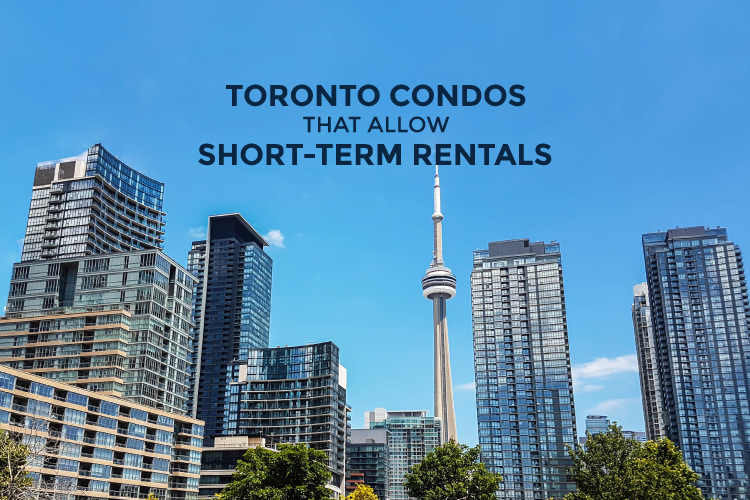 When it comes to rent versus buy Toronto, 2019 may be the year to really look at your finances and weigh the pros and cons of renting vs buying. 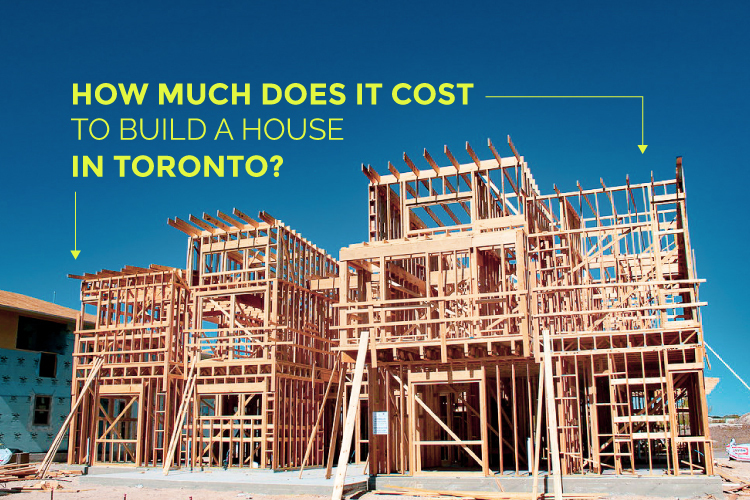 With every passing year it seems that, for many, the dream of buying a home in Toronto slips farther and farther away. Many are posing the question, when will the Toronto real estate market crash in hopes of a price drop to get their foot in the door, both literally and figuratively speaking. Comparably, Toronto also has the highest rental prices in Canada. So when it comes to rent versus buy Toronto, 2019 may be the year to really look at your finances and weigh the pros and cons of renting vs buying. If there’s one thing we know for sure, the best day to buy is always yesterday; as prices climb, the money you do have today will be worth less tomorrow. According to TREB’s data, the average cost of a one bedroom rental in downtown Toronto has increased 23% since Q3 of 2016*. If you knew you’d be paying these record high rents five years ago, maybe you would have pulled the trigger on saving for a down payment. What you’re paying in rent today is comparable to what you could be paying for a mortgage on a condo. If you’re tired of paying these high prices to rent a home when you could own a home, what can you do to make the switch from renting to buying? One of the most challenging hurdles to overcome when it comes to buying a condo is having enough money for the down payment. Let’s say you find a one bedroom condo for sale with a $500,000 price tag. 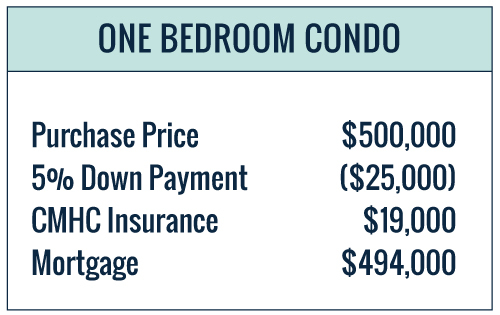 The minimum down payment you can make on that condo is 5% or $25,000. Seems like a lot of money, doesn’t it? And it is. 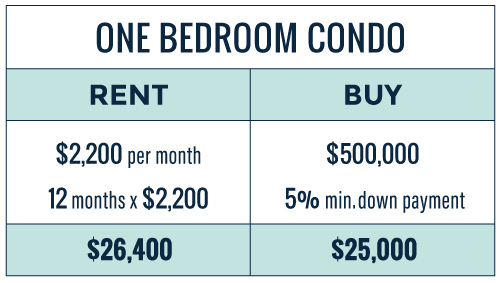 Now compare that to what it costs to rent that one bedroom condo which, in Toronto, is about $2,200 per month. After one year of renting that condo, you’ll have paid $26,400 in rent. Congratulations, you’ve just spent more on a year’s rent than it costs for a down payment on the that same condo. It’s no wonder so many millennials are choosing to live with their parents. It’s not because they’re lazy, it’s because it’s the only way they have a chance in hell at buying a condo in Toronto. According to a recent article by The Star, one third of young adults are living with their parents for this very reason, to save for a down payment. Unfortunately, not everyone has the privilege of living rent-free for a year with mom and pops. Curious to know what you could afford based on your current rent? Use this rent vs buy calculator by RBC. Having enough saved for a down payment is one thing, but being a homeowner comes with a few extra monthly expenses. 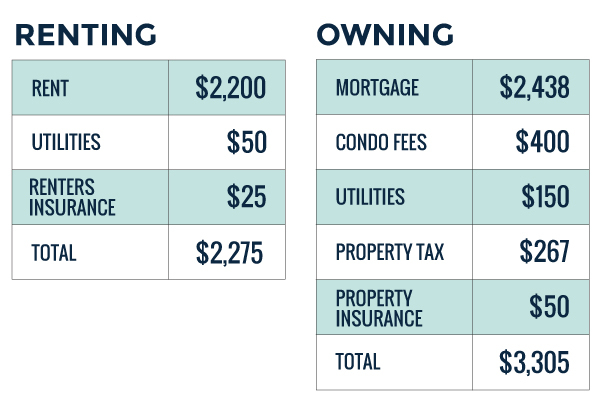 Let’s compare the expenses of renting versus buying. 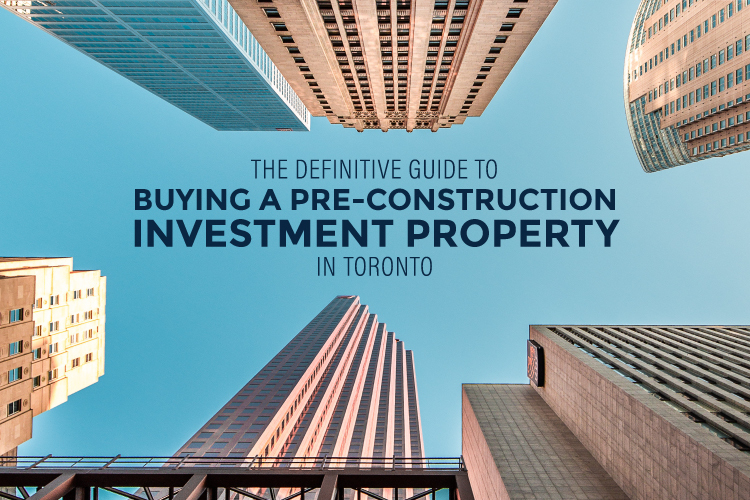 To set the scene, let’s suppose you’ve purchased the $500,000 condo with $25,000 (5%) down. One thing to note here is that because you’ve put less than 20% down, you’ll need mortgage insurance which, in this case, is an additional $19,000 to your mortgage for a total mortgage of $494,000. In order to calculate the monthly costs affiliated with renting vs buying, let’s say you secure a 5 year fixed rate mortgage at 3.39% over a 25 year amortization period. Your monthly mortgage payments will be $2,438. Compared to $2,200 per month in rent, that’s not bad. Remember, the difference between renting versus buying is that when you rent, you’re renting space. When you buy, you’re renting money. So while you’re paying just over $1,000 more to own that condo, think of it as a forced savings account paying into your home equity, unlike renting where you’re paying someone else’s equity. That last point is the biggest homeowner benefit of all. EQUITY. In Toronto’s real estate market, condo prices in particular have been sky-rocketing. In fact, the condo market was leading the industry at the end of 2018 with an 11.4% increase year-over-year. Conservatively and for the sake of projections we tend to use the historical average which is 5% growth per year. After five years of renting, using the current guideline for an annual 1.8% rent increase, your five year rent adds up to $108,444 along with your expenses (insurance and utilities) adding up to $4,500 for a grand total of $112,944. After five years of owning, you’ve paid $68,639 towards your mortgage principal, $77,629 in interest, and just over $52,000 in additional expenses. Your grand total after five years of owning is $198,288. That’s $138,141 you’ve earned in equity just by living there! So while renting you’ll have paid your landlord $108,444 towards their equity, as an owner you’ll be ahead by $138,141 in equity plus the $68,639 towards your mortgage principal. HOW MUCH DO YOU REALLY PROFIT? 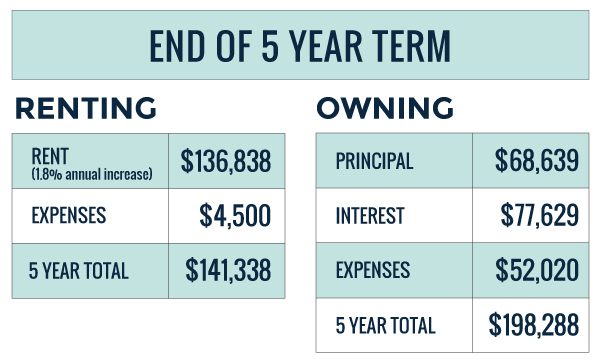 Even though after the five year term your mortgage balance is $425,361, the equity you’ve earned over five years means, if you were to sell that condo, you’d still make a profit. Let’s say you decide you want to upgrade your living situation and at the end of your five year term you decide to sell your condo at its current market value of $638,141. After paying your mortgage balance, closing expenses and legal fees, you’re still walking away with $179,373! Not to mention that because this was your principal residence, all profits earned are 100% tax free! Remember, real estate is a long term investment and the longer you hold a property, the better the returns will be. Not to mention the ability to leverage your equity into building a real estate investment portfolio. But that’s a story for another day! We hope that this analysis of renting vs buying has been eye-opening. For those of you who are ready to make an action plan to buy your first home in Toronto, we encourage you to book a call with us to discuss your unique situation and we’ll help you make the move from renting to buying.